Quality from source to bottle. The quality of our product as well as the transparency to our consumers are absolute paramount for us, who have the peace of mind of always buying pure untouched bottled water as it flows from the spring. Drink Goccia di Carnia, preferably before the expiry date indicated on the cap, on the bottleneck or on the label and keep it away from light, in a cool and dry place, clean and odourless. 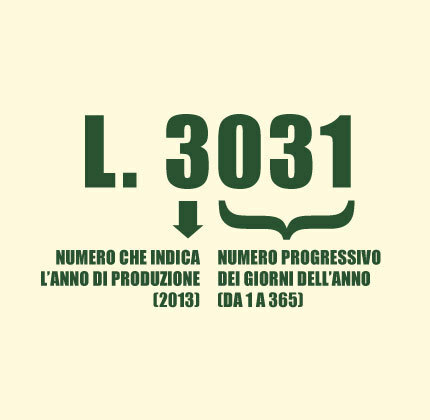 In addition, you can check Goccia di Carnia’s “bottling date” with the batch number anytime: it is the four-figure number printed on the neck of each bottle after a capital L.
Reading from the left the first number refers to the year: 2 stands for 2012, 3 stands for 2013 and so on. The other three figures represent the number of days in that year, from 1 to 365. For instance, batch number 3031 means that the batch was bottled on the 31st January 2013.